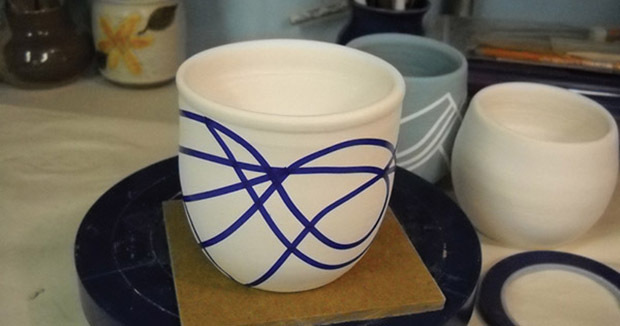 Ceramic artists are some of the most creative people out there when it comes to the tools of their trade. Nothing is off limits as a potential clay tool and no clay tool has just one use. To prove it, we’ve gathered some of the most clever tips and techniques out there for making clay tools. Homemade clay tools can be as simple as a using a credit card for a throwing rib, or as complex as constructing your own homemade extruder. In our Making Clay Tools archive, you’ll also find out how to make your own extrusion dies from old credit cards and how to make some cool pots using the extruder! Slab rollers are a great handbuilding tool. Sure, a rolling pin can do the job too, but if you are really serious about slab building, there’s nothing like a slab roller for making beautiful, consistent slabs. But a slab roller doesn’t have to be quite as expensive or space consuming as you would think. How a DIY slab roller that can fit in an apron pocket and costs under 10 bucks? If you’re a wheel thrower, there is plenty for you here too. You’ll learn everything from making your own pottery bats to a super smart ceramic chuck for trimming pots. Want a throwing rib that fits perfectly in your hand? You can learn how to make your own here! Plus you’ll find tons of great ideas for setting up a functional studio without breaking the bank. Don’t let clay go down the drain and ruin your plumbing! Make your own clay trap for your sink with simple to find, inexpensive materials. With all of the practical advice and helpful tips in our clay tools archive, it will quickly become your favorite spot on Ceramic Arts Daily! We’re adding stuff all the time so check back often! Learn techniques from the pros when you download this freebie, Clay Workshop Handbook.